Birmingham&apos;s Aston Expressway – used by 90,000 motorists a day – is at "considerable" risk of collapsing, according to an official report. A Greater Birmingham and Solihull Local Enterprise Partnership (GBSLEP) document reveals the raised section of the seven-lane expressway, which links to Spaghetti Junction, needs massive investment to fix it. The authority estimates £26 million of repairs are required to make the 40-year-old carriageway safe. The severity of the situation was highlighted by a £2.63 million engineering survey which revealed the full extent of decay along the primary route into Birmingham city centre. The GBSLEP is now bidding for Government funding to carry out repairs to the route, also known as the Tame Valley Viaduct. But council highways engineers warn that if strengthening work is not carried out soon they will need to introduce weight restrictions. They admit the knock-on effect for the region’s road and motorway network could be catastrophic. The first of three phases of works on the expressway began in 2011, at a cost of £2.63 million, to assess the extent of damage and decay. A second phase is due to begin later this year and will strengthen one of the 21 spans in a £2 million cost. It has been known for some years that the road had severe problems, with temporary repairs and support to tackle &apos;concrete cancer&apos; but now it has emerged that more dramatic action is needed. 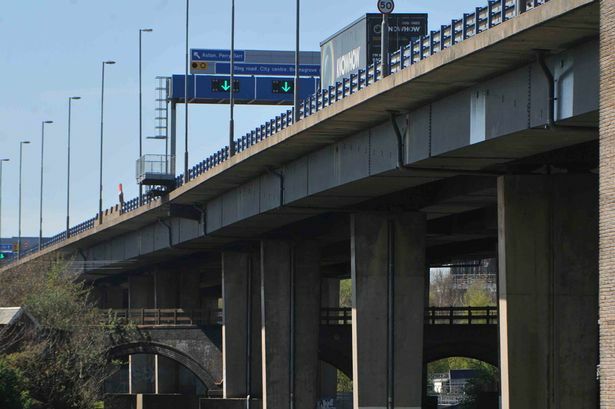 Phase one surveys revealed that the condition of the structure, which stretches from Spaghetti Junction to Aston Waterlinks, requires urgent action and that confirmation of the third and largest tranche of funding is urgently needed to avoid weight limits or even closure of the road. The LEP&apos;s Strategic Economic Plan describes the viaduct as a &apos;fragile asset&apos;. It states: "Without action to maintain the viaduct, the risk of weight restrictions and collapse of the viaduct is considerable. Action is deemed necessary to maintain the viaduct and remove any risk of structural failure or of having to impose weight restrictions on the viaduct, the economic cost of which would be significant. "A series of ever-more refined assessments have established beyond doubt that there are deficiencies within the structure. "Thin walled box girder bridges are known to be a vulnerable form of construction and this has necessitated the strengthening of many similar major structures. "The A38 (M) Tame Valley Viaduct provides a critical link between the city centre and M6 via the well-known Spaghetti Junction. "The road uses the Tame Valley Viaduct to access the very heart of the city centre. However, the load carrying capacity of the viaduct is of concern to the city council and local partners and now is the time to act to maintain the city&apos;s connectivity to external markets via the viaduct." The report admits there is no practical alternative to the huge upgrade. It also states that carrying out the work will avoid potential claims for damage and personal injuries should the structure collapse. A monitoring and patching-up programme is currently taking place which has cost £750,000 in the last three years. The report adds: "A worst case scenario is total failure of the structure, similar to that of the Hammersmith Flyover in London and the M4 structure affecting the main route from Heathrow Airport into central London in 2012." Closure or restrictions would have huge consequences for the local economy with, in particular the new Advanced Manufacturing Hub at Aston as well as Birmingham city centre development. It could also lead to further congestion on alternative routes in the city – such as Lichfield Road in Aston. Like the M6 and Spaghetti Junction, the Tame Valley Viaduct has for many years been carrying more than double the number of vehicles it was designed for. This heavy load of cars, coaches and lorries pounding the concrete each day means the pillars and posts take much more punishment than they were designed to cope with. The Highways Agency started concrete reinforcement works on the nearby elevated sections of M6 in 2011. A Birmingham City Council spokesman said: "Detailed assessments of the A38(M) Tame Valley Viaduct have revealed structural deficiencies in the carrying capacity of the viaduct. "Implementation of a three phased management strategy for the viaduct began in 2011. "The first phase, due for completion by June this year, involves a £2.63 million assessment, strengthening design and installation of a state-of-the-art real time monitoring system for the viaduct. "Phase two of the project with a budget of £2 million, due to commence later this summer, will involve strengthening of a trial span. "The outcome of this phase will provide the opportunity to optimise details of the design for the entire structure, leading to refinements to the overall scheme design. "Phase three of the management strategy involves strengthening the remaining 20 spans of the viaduct. We are currently identifying funding for phase three, including a bid to the GBSLEP. "The current management strategy will ensure structural and operational safety prior to the implementation of the full strengthening works on the viaduct." Jerry Blackett, chief executive of Greater Birmingham Chambers of Commerce, said: "Clearly, any long-term disruption to this major route in and out of Birmingham would be extremely damaging. "Many business rely on this route to not only move goods in and out of the city but also their staff so it&apos;s important that any problems are dealt with speedily. "It also underlines how fragile our region&apos;s transport infrastructure is when one problem is potentially capable of causing considerable damage. That is why it is critical that the region presses on urgently with integrated transport plans and the development of HS2."